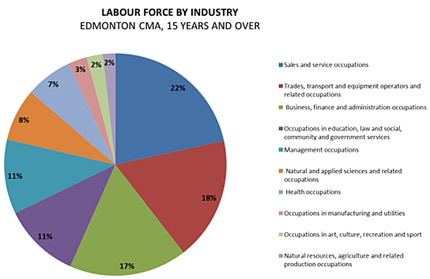 A skilled and motivated labour force is needed to realize Edmonton’s business and industrial development potential. Edmonton benefits from a younger, growing population – and one actively motivated to work. Over the past decade, Edmonton’s population has grown 1.5% - 3% per year with the 2011 Canadian census indicating 11.2% growth for the City of Edmonton between 2006 and 2011, double the national average. Edmonton has a seasoned and sizable workforce over 45 to mentor younger employees. Edmonton is home to Northern Alberta Institute of Technology (NAIT) one of Canada's largest trade apprenticeship trainers. Albertans have the highest productivity rate in Canada. A 73.5% workforce participation rate illustrates a population actively engaged in Edmonton’s economic prosperity. A growth in immigration over the past decade has added significantly to the multicultural nature of Edmonton’s workforce and community. These skilled immigrants expand the multilingual capacity of the community and strengthen global connections from Asia, the Middle East, Europe and South America.